Beef tendon is that piece of gelatinous, transparent, soft yet chewy morsel that you either love to bits or shun it. In Cantonese it is call ngau kan and is used to make ngau lam meen. However, I do not like the beef tendon noodles served by Taiwanese or Hongkie restaurants because they use too much spices such as cloves, star anise and cinnamon and the sweetish taste from the soya sauce makes the beef tendon very cloying or jelak. However, I love the sup urat which is sold by the sup kambing and sup lembu stalls. They use a different kind of spice and that balance out the rich taste of beef tendons. 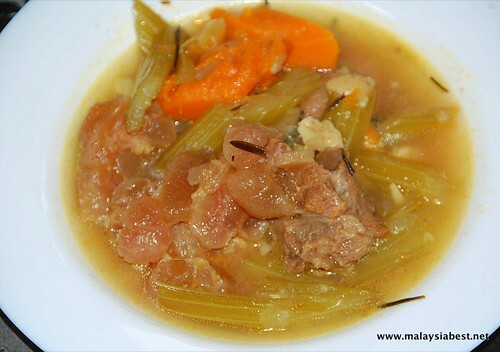 So, I try to cook something like the Malay sup lembu but I combine it with some Western herbs like rosemary and sage. It is really easy to prepare. 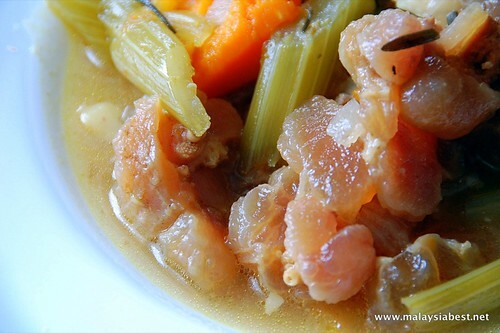 However, you need to have patience stewing the tendon as it takes hours to get soften. I use a pressure cooker and takes about 45 minutes. This is how beef tendon looks like. The two whitish pieces are the beef tendon and they are Australian beef. 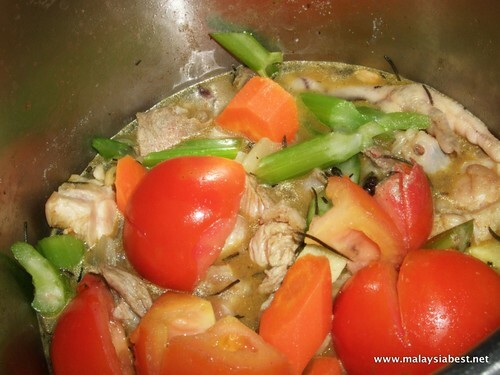 The meat part is Malaysian cow, used to flavour the stew as tendons generally is tasteless and need spices and herbs to make it flavourful. Beef tendon is pack with collagen and that’s why Chinese believes that eating tendons (pig’s one is very expensive and sold in dried form) will give us stronger legs, i.e. no joint pains. 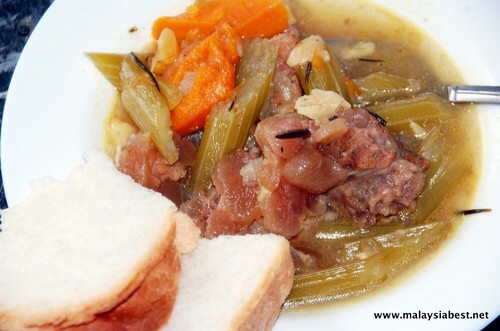 There is no hard and fast rule to making a good stew. You go with what you have in your larder and add according to your ‘feel’. The Indian Muslim butcher told me that nowadays, people hardly know how to cook beef tendon because they usually refer to recipe book and add the things according to the book. You cannot get a nice taste when you are too conservative. Just go with the flow, add without counting the spoonfuls or weight. Spices (powdered) – If you have cajun pepper, garam masala, give the meat a good rub. If not, use several tablespoons of meat curry powder. Some olive oil for browning the meats. You can dump everything into a pot. Or if you like, heat the pot with some olive oil and quickly brown the meats before adding the vege, spices, herbs and water. Leave to cook over low fire till the tendon is soften. It will take a long time for the tendon to soften so do not attempt this if you are an amateur cook. In one of Jamie Oliver’s recipe, what he did when stewing is to put the ingredients in a heavy pot and put the pot in the oven at 160 deg celcius for 3 hours or 140 deg celcius for 6 hours. When the beef tendon is tender, add salt. To garnish, add some chopped Chinese celery and spring onions and fried shallots. My stew looks a bit pale because I didn’t add some dark soy sauce to brown it. It will look better with some dark soya sauce but the taste is the same, whether pale or brown. I bought a loaf of roti bengali and had the stew as lunch. Yummy. It is going to be the year of the ox this Chinese New Year, so eat lots of beef, ok? Hehehe. looks yummy. i’ve always wondered what tendons are made of though… proteins, fats or carbohydrates? does anyone know?